I'm just going to put my hands up and admit, I'm a bit of a (huge) craft geek. I could honestly spend all day sitting around making whatever crafting project takes my fancy that week, whether it be card making, scrapbooking or any of the other projects in the wonderful world of crafting. Sadly though, I did have to give up crafting on a regular basis when I started year 11 as the school work load increased, but now I have the whole summer ahead of me, I'm determined I'm going to start it all up again. And so my search began for a whole load of exciting new craft projects, I could get into. Of course, my search began at the crafters-paradise that is pinterest (shameless self promotion moment: if you'd like to follow me on pinterest and stalk all of my pins and boards, you can find me here). Today I thought I'd share with you some of my ideas for craft projects. The plan is to later on feature tutorials for some of my favourite projects, here on my blog, for all your lovely people to see. First up, there's this paint-sample calender. I've seen this dotted around pinterest for so long and I really want to do it. It's made up of a seven rows of paint samples (they could be the same, like in the image, or different colours; it's up to you) that are stuck down onto a piece of card. Then, all the neccessary details (such as days of the week) are popped down on top of the samples, and the whole thing is popped into another fancy frame. 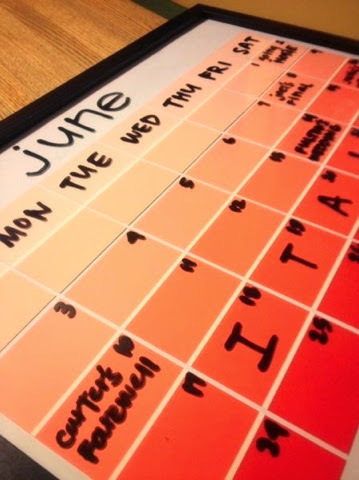 You're then free to write on the glass and use it as you would any normal calender, using a dry wipe marker of course. I think this would look super cute in my room, especially if I choose pastel colours, as they fit in with my colour scheme. This is definitely a project I'm going to try out and write a post on, so keep your eyes out. The second project I'd like to share with you, is this lovely scrabble coaster project. This could look so lovely, and it's actually simpler than it looks. 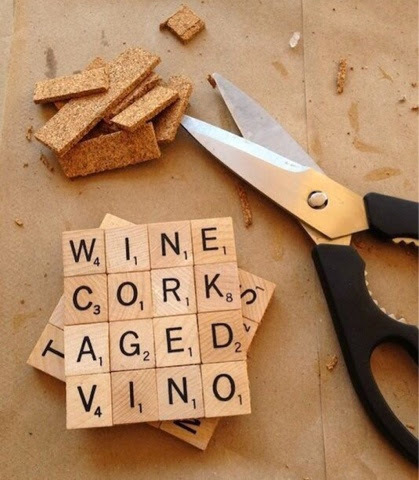 You simply stick a selection of scrabble pieces onto a large piece of cork - creating words of your choice - using some type of strong glue and cut the edge of cork off, leaving a lovely coaster. Obviously, this project looks better using woodern scrabble tiles and you can pick up bundles of these tiles on the likes of ebay. This is such a cute little project, as everyone needs a coaster, right? And what's better than a personalised one? Finally, we have the most complicated project of the ones I'm featuring today; a beautiful DIY rose. 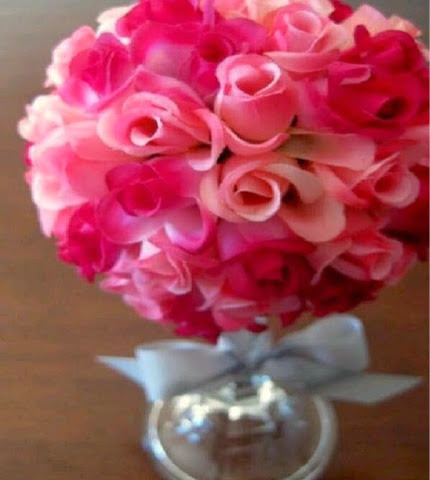 To complete this project you'll need: a selection of fake roses; a candlestick holder (or similar), a Styrofoam ball (craft shops sell them for a couple of pounds), glue and some double sided sticky tape. All you need to do is stick the roses securely into the ball, using the glue and making sure that all of the ball is covered. Then, you just attach the ball to the candlestick and you're good to go. The only thing that makes this project complicated, is it's going to be quite fiddly. But practise makes perfect so give it a couple of tries. This would look beautiful in my room, so I'd love to give it a go. Hopefully this post has not only given the crafty-ones amongst you a bit of inspiration for future makes but also helped to share the crafting love with the less-crafty bloggers and encourage a few more of you to get creative. Crafting can be so relaxing and you end up having lots of lovely handmade bits and bobs; what more can you ask for? Have you got any ideas for new craft projects? Let me know!